The album opens up with “Blues:Unpardonable” which as its name suggest, is quite a driven bluesy track with some nice guitar riffage and a nice sense of dynamics. The vocals are quite interesting and tend to drive the songs along more than anything else other than guitar. “Borderline” offers more of a contrast to this track, with a bit more of a laid back sound and some nice emotive vocals in a cool chorus. There are also some really nice bass guitar parts here. The album covers a nice variety of styles, from the almost Southern stylings of “Ella-Marline” to dark brooding tracks like “Can’t Stand You Anymore.” For me, one of the highlights of the album was the track “How It Ends” which has a nice sense of build-up and a nicely layered chorus. The album ends with “Goth Has No Name” which opens with some nice atmospheric piano chords and some interestingly performed vocals too. This closes the album nicely with a contrasting to sound to most of the album which makes it end in an interesting way. The production is pretty good, you can hear everything that’s going on well enough, and the guitars and vocals in particularly shine here as they would tend to do in an acoustic style album, with some nice moments from the rhythm section that really add depth. 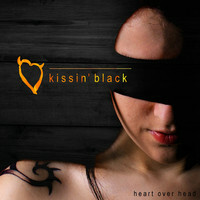 “Heart Over Head” is a solid album, with some interesting songwriting and a nice sense of variety.